I love hashbrowns. I always have. When I was growing up back home in GA, we didn't go out for breakfast very often. Of course, with parents who cooked like mine did, there was no need- but I never appreciated that when I was younger. When I got older and got out on my own, going out for breakfast was a special treat. Early on, before I discovered my obsession with cooking at home, I thought a great breakfast was Waffle House. My favorite breakfast at Waffle House? An American cheese omelet with white bread toast and a huge order of scattered and smothered hashbrowns. Looking back, I realize they were a greasy, gooey gut bomb- but at the time it was the greatest thing ever. Fast forward a few years (ok- quite a few years). I am married and live in a little Colorado town where decent restaurants don't really exist. We do go out for breakfast every once in a while, but for the most part I'm happy creating amazing weekend breakfasts right in my own kitchen. But one thing hasn't changed very much- I still love hashbrowns. I finally have them down to a consistent science. 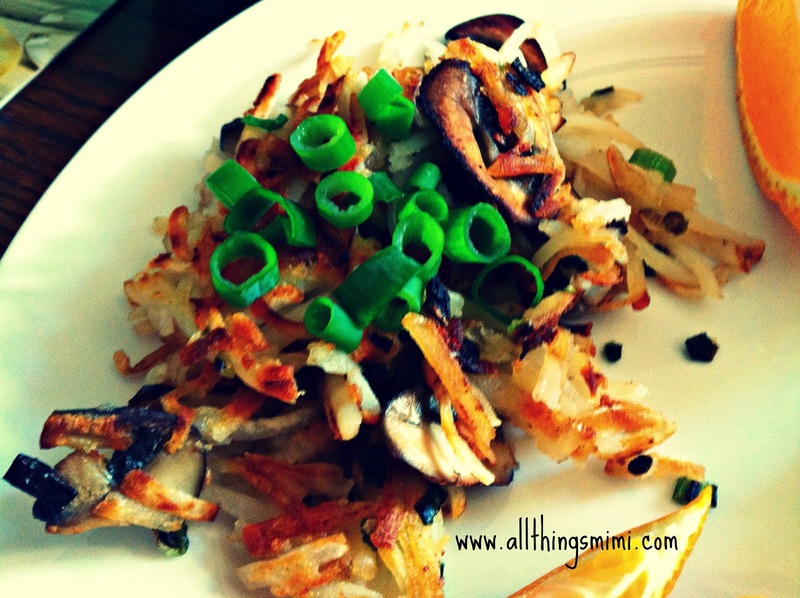 If you like your hashbrowns the way I like mine- slightly crispy and charred- full of onions and mushrooms- read on and make these as soon as possible! The American cheese omelet and white bread toast are optional. I use frozen shredded potatoes. Yes- I could grate a potato on my own, but I choose to spend my time doing other things (like eating hashbrowns sooner). I always use my daddy's cast iron skillet, because it is incredibly well seasoned and nothing sticks to it. If you have any doubt at all about yours- use a non-stick skillet. These potatoes will bond to any not non-stick surface. To clean the pan you'd have to soak it for a week. Anyhoo- I heat up the iron skillet over medium heat and put in a good bit of olive oil and bacon drippins. While that is melting, chop up about half of a medium onion. I usually leave mine in fairly large pieces, so I know they're there. If I have mushrooms, I'll slice those and throw them in the skillet as well. You can use any veggies or leftover cooked meat you have around. After that gets to sizzling, I throw in about 4 good handfuls of the still frozen potatoes. I mix it around a little then try to leave it alone while I move on to other parts of breakfast. I want a nice crust to form at the bottom of the pan. But keep an eye on it- you don't want to flat out burn it! I use a spatula to turn large portions of them over in an attempt to preserve the crusty-charred part. When they are appropriately crusty and charred, I put the heat on low and leave them until the rest of breakfast is ready. When I plate them, I garnish with fresh chopped scallions, if I have them. I love the combination of the grilled onions in the hashbrowns with the bite of raw onion on the top. This is one of the few dishes I honestly think I do better than any restaurant version I've ever had. When I order hashbrowns out, I am always disappointed. I hope these turn out well for you. If you don't have the well-seasoned cast iron skillet, it really is worth the investment (and really- they aren't horribly expensive and they last forever- you'll be leaving it to some lucky person in your will).